In late May, I traveled to Baltimore to learn more about the new Guinness brewery project unfolding there. Guinness is a sponsor of this blog, and I wanted to be one of the first to delve deeply into the thinking behind the project, its scope, and its goals. Guinness was happy to make this possible, and paid for me to visit. Today I look at the brewers hired to create an "American" Guinness. Previous posts: the new project and Guinness's American strategy. Away from the brewhouse, breweries can do a lot to develop a brand, a marketing and sales approach, and a strategic plan for growth, but the vagaries of customer opinion usually exert the greatest force on a company's direction. A brewery is defined by its beer--and therefore the skill and vision of its brewers. When Guinness decided to create an American beachhead, one that would produce beer specifically for the American market, the company went on a months-long national search to find the brewers who would head things. 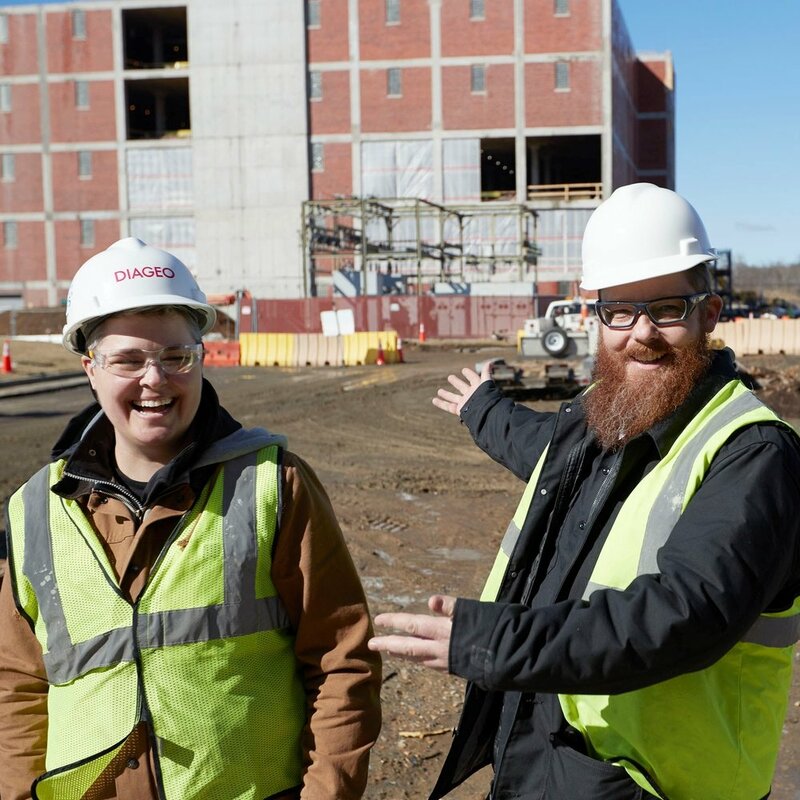 They hired Peter Wiens, Hollie Stephenson, and Sean Brennan, who will be tasked with figuring out what "American Guinness" beer will be. I spoke to Wiens and Stephenson during my visit, and in their backgrounds and interests one might intuit the direction the brewery will head. Along the way, I discovered an experimental side-road that may take the company back into its history. Peter and Hollie are both Stone Brewing alumni, and both hop fans, but they have very different backgrounds. Wiens started his career in his family's wine cellars before getting a degree at UC Davis. From there he spent twelve years at Anheuser-Busch, working his way up through brewing and into the business side. Eventually he left A-B for Stone, and was heavily involved in the new Virginia brewery, where he became the director of brewing operations. So, while he's most recently worked on the craft side, he has deep experience in large-scale production brewing. Hollie Stephenson, by contrast, has a much more typical craft background. She was working as a DC lobbyist when she developed a taste for beer. When an opportunity to help launch a brewery in DC arose, she trained in England and returned to became the brewer there. She then spent three years at Stone and returned to the East Coast as head brewer at Highland Brewing (Asheville). Highland is one of those first-era breweries that hadn't changed much through its first two decades. Hollie modernized the lineup with IPAs and a well-regarded pilsner. She told me, with some wonder, "They had existed all that time without an IPA." The new site has two breweries--a 100 hectoliter production kit and an experimental one that's just 10 barrels. They will both draw on the brewers' strengths. I found Hollie in the ten-barrel brewhouse when I was touring the site, and it was already up and running. There are some similarities between Highland and Guinness--both had well-established beers when she arrived, and reputations for tradition, not innovation. That changed when Hollie went to Highland, even though she expected to just be brewing the standard line. "I got to add four beers to their year-round lineup and various other seasonals and small, hundred-barrel release-type things. So, I ended up getting to do a ton of new beers for them." Highland, like Guinness Baltimore had a small system (3 barrels) and a big 50-barrel production brewhouse. 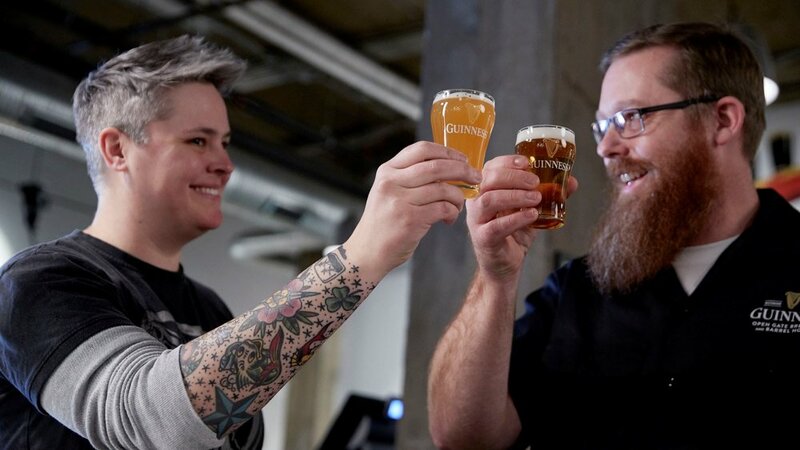 She is looking forward to brewing different kinds of beers on Guinness's small system: what she calls "utilitarian R&D," to try out new hops, for example, experiments for beers that might go to a larger audience, R&D for the barrel-aging program, and then beer "just for fun." They also have the Harp lager yeast, and she's excited to experiment with that--including dark lagers. Much as with Highland, she will be relied upon to help bring Guinness Baltimore into the modern craft world. One of my great regrets, stoked by my visit to St. James Gate, is the loss of wild yeast in Guinness stout. Until well into the 20th century, Guinness was still aging its Extra Foreign Stout in one of the almost endless vat houses that line the streets on the approach to the brewery and was famous for its richly complex, funky undertones. The shift to nitrogenated stout, the move away from strong, bottled beers to sessionable beers to compete with lagers--all these trends did in the barrel-aged beer that had been made in Dublin for 200 years. Peter Wiens knows this history, and he suggested that a way forward may lie in the past. When he first began talking about this, I assumed he meant trying to reestablish stouts in general--something breweries of dark ales have been trying to do in the face of the IPA incursion. "There's a lot more left to be done with stouts," he said. "I really want to focus a lot on the history we can bring to stouts in terms of the barrel aging we can do." But then he mentioned something more interesting. I wistfully invoked Guinness's history of vat aging and he agreed. Peter has always wanted to work for Guinness and knew its history well. He's also interested in exploring some of those old ways. "The other thing is, over here, we have some of the wild yeasts you're talking about." As I mentioned earlier, this is one of the advantages Diageo brings to Guinness. The new site is on an old campus studded with rick houses for aging whiskey and the company has access to lots of liquor barrels. But Peter has discovered other advantages. "That exactly the historic stuff I was talking about, bringing some of that back. Some of the Seagram's stuff we have from sixty, seventy years ago and you can see where they collected it, and it was from [a certain] flower. If you think about spirits and you think about they're fermented in these open wooden vats that aren't necessarily the same hygiene as beer--it contributes to the flavor. It's like sourdough yeast; you get the predominance of a certain blend of microbes." Guinness plans to start out with four fairly safe early beers--a milk stout, a blond, an IPA, and a wheat ale. No doubt hops will play a role in the brewery's immediate future as well. I am most excited about some of the more exotic possibilities living in slants somewhere in labs in Baltimore. They may never become best-sellers, but could revive an old and lost fixture of Guinness's history. (Diageo may be placing a long bet on this as well. Sean Brennan, the third member of the team, came from Jolly Pumpkin, where he worked with barrel-aging and wild yeast routinely.) It would be a fascinating irony if Guinness's arrival in America helped rediscover its old Irish roots. Can Dos Equis Sell Pale Ale in America? Enzymes and Glitter Are Hopelessly Passé: Activated Charcoal is the Next Thing in Beer!